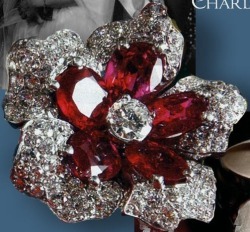 The diamond and ruby parure was made by the austria court jeweler Koechert. It was part of her wedding presents, later owned by the Duchess of Wurtemberg, Diana of France. Eine myhrthengeschmückte, jugendholde Braut zieht abermals aus der ehrwürdigen Burg der Habsburger in die Fremde, in das stammverwandte Schwaben, um daselbst eine neue Heimat zu finden. Erzherzogin M a r i a R a i n e r i a folgt dem Manne ihrer Herzenswahl, Herzog Robert von W ü r t t e m b e r g, ins weinbergumkränzte Stuttgart, ins schöne Württemberg, das Land, welches den Deutschen so viele große Dichter und Denker geschenkt. Reinste Herzensneigung, nicht staatsmännische Raison, bat die fürstliche Waise aus Habsburgs Stamme, das Mündel des allverehrten Herrn Erzherzogs Rainer, bestimmt, die Werbung ihres erlauchten Bräutigams anzunehmen. S. k. Hoheit, Herzog Nikolaus von W ü r t t e m b e r g, als Vertreter S. Majestät, König W i l h e l m II. A n n u n z i a t a und E l i s a b e t h A m a l i a, Herr Erzherzog Franz Ferdinand, Herr Erzherzog Otto und Frau Erzherzogin M a r i a Jo s e p h a. 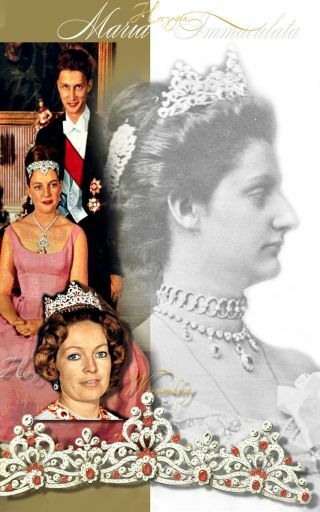 B l a n c a, Herr Erzherzog F ranz S a l v a t o r.
und Prinz A l b r e ch t zu S ch a u b u r g – L i p p e.
she wore the altered Diamond Tiara from Archduchess Maria Immaculata Raineria of Austria. Once a wedding gift the her, made by Köchert. The imperial marriage present was given to the Archduchess Maria Raineria Immaculata when she weds Robert Duke of Wuerttemberg. 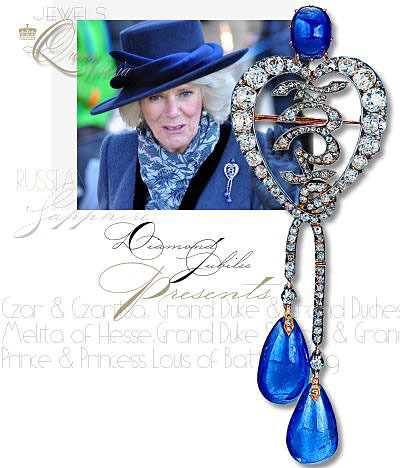 When I prepared the two magazin side, about Archduchess Maria Immaculata Rainera, Duchess of Württemberg in 2009 – I missed a clear picture of the details of the nice tiara. Now we had a wonderful closeup. 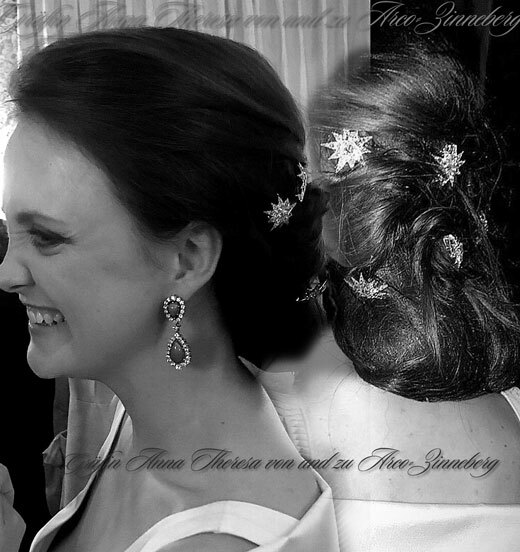 Entry into Vienna – 23 April – Her Royal Highnesses the Serenest Bride Princess Elisabeth of Wittelsbach and Duchess Louise in Bavaria. Her Royal Highness the Princess wore a round pink atlas dress with a white surface, a lace sash around her neck, a diadem of diamonds in her hair, surrounded by a wreath of white and red roses. On the day of her marriage, April 24, 1854, Sisi wore a white silk dress Moire antique, with rich embroidery in gold and silver, and a long, gold-embroidered court train, which was fixed as an independent element over the dress. Waist and sleeves were richly decorated with silver blondes. A precious veil of Brussels waved down from the beautiful hair of the most garish princess. This train, at the top of the picture, was kept as a special memento of Sisi’s favourite daughter Archduchess Marie Valérie and could be purchased in 1989 from the descendants of the Archduchess for the wardrobe depot. The wedding dress was donated after the wedding to the pilgrimage basilica Maria Taferl and is now exhibited in its treasure chamber in the form of a messcoat. 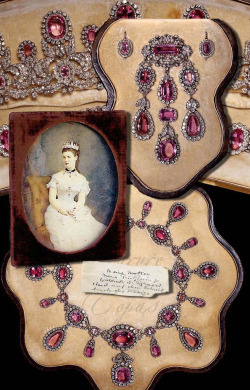 The golden wedding jewellery of Empress Elisabeth is a sumptuous floral wreath made of gold spun as hair jewellery, a chest buckle and two combs (the horn part of the combs can be seen in the upper picture), which were stuck into the hair behind the ear and thus also served as ear jewellery. 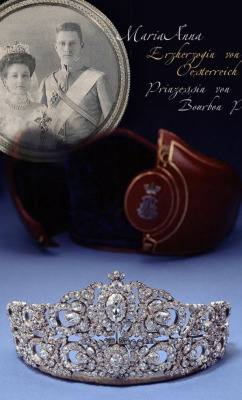 The bridal jewellery was donated by Prince Konrad of Bavaria to the pilgrimage chapel Altötting, the youngest son of Gisela and grandson of the empress, who mentioned that both his mother Gisela (on the occasion of her marriage to Leopold of Bavaria) and his grandmother Sisi (on 24 April 1854 in the Augustinian Church in Vienna) wore this bridal jewellery. 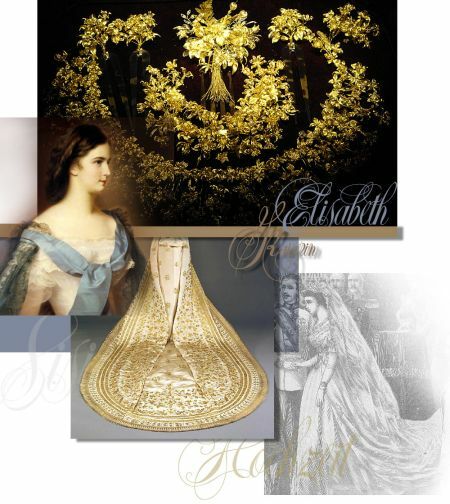 Unfortunately there is no clear wedding picture of the two marriages, so Elisabeth as the bride was not decorated with precious jewellery as one would have expected from an empress, but with this rather simple bridal wreath made of gold. Her dowry amounted to 50,000 gulden in cash, and her dowry list also included jewellery, precious objects and jewellery, gold utensils, jewellery, silver and of course wardrobe worth 70,000 gulden, but was very modest for a future empress. In addition there was a diamond tiara, an attention of her husband to the value of 100,000 gulden. In return, however, she was asked to sign a clause in her marriage contract stating that her Bavarian relatives were not entitled to the inheritance – which, according to tradition, the empress did hesitantly and weeping. „Sisis“ annual Apanage amounted to 100,000 gulden (that of the Empress Mother 50,000 gulden). 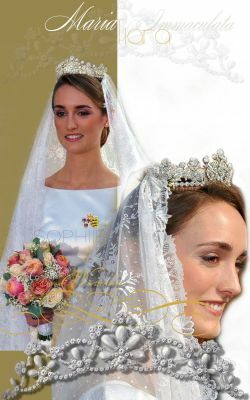 In the official festive programme, the bridal jewellery was wrongly described as follows: The bridal wreath, wound from fresh myrtle and orange blossom, was held by a splendid diamond tiara worn by Her Imperial Highness Archduchess Sophie on Her Majesty’s Day. On the shoulders precious brilliant-cut diamonds held the coat…..there was no coat on the pictures – but the train. On the evening of 26 April, the Court Opera Theatre offered the magnificent sight of a glittering feast. The cream of all the awards that the higher circles of the Residence had received, and the tickets that were issued, was gathered in the evening and competed in the shine of diamonds and pearls, order stars and uniforms Her Majesty the Empress a light blue silk dress with white echarpe and a pink diamond-studded wreath in her hair. Court Ball at the Wedding – The highest and most distinguished guests of Her Majesties were invited to this magnificent feast, which took place on 27 April in the Imperial and Royal Hall of Knights. The most beautiful wreath of our noble ladies adorned the ballroom, the wealth and splendour of the toilets, which shone with jewels and flowers, the manifold uniforms of the diplomatic corps embroidered with gold and silver, the civil servants and the generality, with the shining signs of their glory and their merits, offered a magnificent sight. 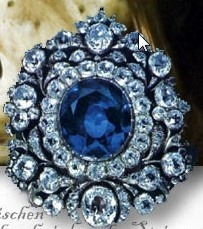 Wherever the eye looked, brilliant-cut diamonds and precious stones of the most precious kind shone. Sr. Royal Highness the Duke of Cambridge, wearing the English general’s uniform, was given the honour of leading Her Majesty the Empress by the arm into the hall, Her Majesty wearing a white moire dress that evening, the lap of which was littered with floral garlands and diamonds. A precious belt of diamonds wrapped around the waist. Her Majesty the Empress opened the ball with the Duke of Cambridge. Her Majesty still rested to dance with several lords archduke and the prince Allersberg. Also Se. Majesty the Emperor rested to take lively antheil at the dance. 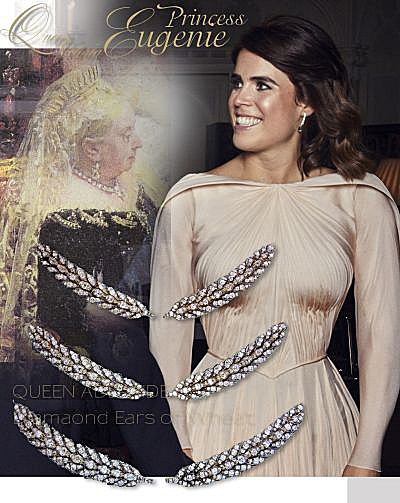 On the second occassion of her marriage, Princess Eugenie is wearing another historic jewel from the Queens vault, the Queen Adelaide’s Ears of Wheat Brooches/Hair ornaments. Princess Eugenie also wore a hair slide belonging to Her Majesty The Queen, the Wheat-Ear Brooches. King William IV commissioned a set of six diamond ears of wheat to be used as brooches or hair ornaments in 1830 for Queen Adelaide, using 580 diamonds from King George III`s collection, they were among the heirloom jewels handed over by Queen Adelaide to Queen Victoria in 1837. Due to the King of Hanover`s successful claim against Queen Victoria for Queen Charlotte`s jewels, three of these had to be remade in 1858. Princess Eugenie, daughter of the Duke of York and his former wife Duchess Sarah, on her wedding day, wearing the Greville Diamond Kokoshnik Tiara, lent by her grandmother the Queen. The royal tiara was made for Mrs Greville a famous jewellery collector, by Boucheron and bequeted to Elizabeth The Queen Mother in 1942, she wore it not in public, „In the bad time“… instead after the war. Closed friends, from the beginning – Margaret Greville rose to become a millionairess and prominent society hostess and friend to the royalty and politicians. A ‚beeress‘, her father making millions from McEwans lager, following an advantageous marriage to one of Edward VII’s best friends, Captain Ronald Greville, Mrs. Greville created two magnificent houses, Polesden Lacy now National Trust and the opulent luxury, 16 Charles Street, Mayfair. Mrs. „Ronnie“ Greville courtship the Mountbattens and the Duke and Duchess of York, who became King George VI and Queen Elizabeth, and in fact, both are honeymooned at Polesden Lacy. Among her friends she numbered Edward VII, Queen Mary, George VI and Queen Elizabeth, Queen Ena, Sir Ernest Cassel, the Rothschild and Mussolini. She lived of tumultous historic events, as the halcyon years of the Edwardian era, the Roaring 20s, the Depresssion, two World Wars, and the London Blitz. 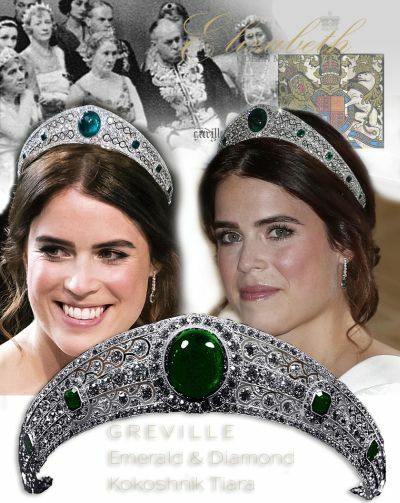 Greville Emerald Tiara Kokoshnik Princess Eugenie Royal Wedding Mrs Greville wore the tiara on some royal occassion, as well as pictured on top in the second row in 1937, like a bandeau. Gräfin Anna Theresa ist die älteste Tochter des Unternehmers Riprand Graf von und zu Arco-Zinneberg und Maria Beatrice Gräfin von und zu Arco-Zinneberg, Erzherzogin von Österreich-Este. Die Braut trug zur Brautsoiree Diamant Sterne im Haar – eingesteckt in die üppige Frisur, wie ihre Vorfahrin Kaiserin Elisabeth von Österreich auf dem berühmten Winterhalter Bild. Ist eine Diamant Sternen Garnitur im Besitz der Mutter der Braut oder der Familie, Maria Beatrice Erzherzogin von Österreich-Este. 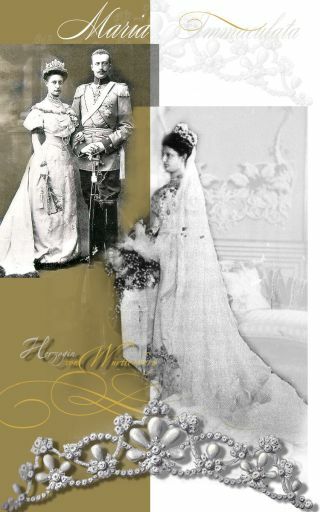 Which of the different star set is in the possession of her mother Archduchess Maria Beatrice of Austria-Este or the family?